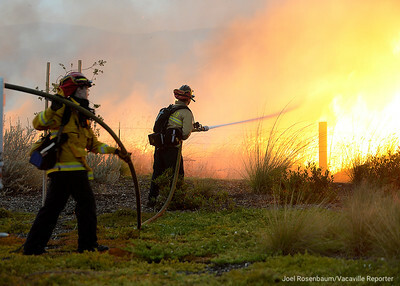 Firefighters from the city of Napa make an attack on a flare of of dry grass along Hancock Drive Friday in Fairfield. 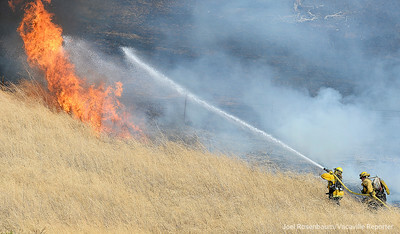 The crew was one of several in the Gold Ridge subdivision off Peabody Road while performing structure protection, as they battle a 1,000 acre grass fire that burned between Vacaville and Fairfield and started along eastbound Interstate 80 near Lagoon Valley Road. 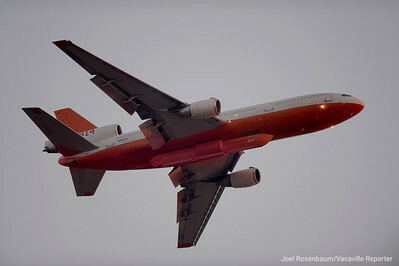 A contract air tanker makes a fire retardant drop on hillside above Discovery Way Friday in Fairfield. The VLAT (very large air tanker) was one of 6 fixed wing aircraft that were dispatched to the a large grass fire that burned about 1,000 acres between the cities of Vacaville and Fairfield. 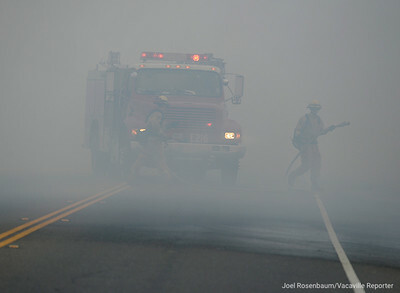 Smoke billows into the air from the 1,000 acre Nelson Fire in the hills above Lagoon Valley late Friday afternoon. 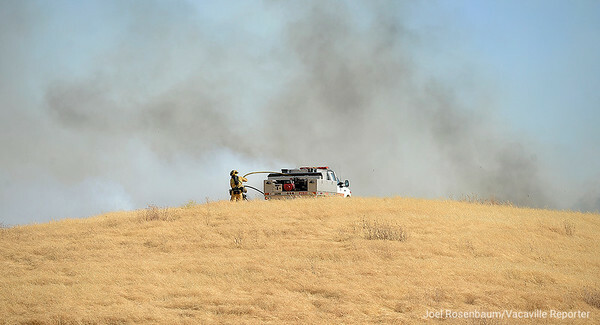 Firefighters from the Vacaville Fire Department make an attack on a flare up on the hillside above eastbound Interstate 80 near Nelson Road. 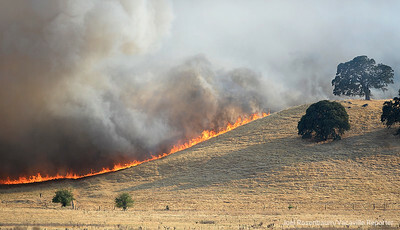 The 1,000 acre grass fire that started along the freeway and burned between Vacaville and Fairfield. A firefighter from the Fairfield Fire Department make an attack on the hillside above eastbound Interstate 80 near Nelson Road. 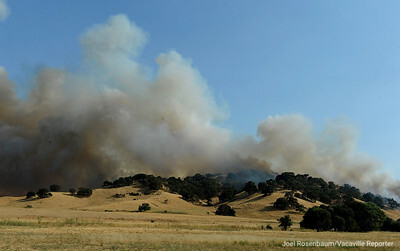 The 1,000 acre grass fire that started along the freeway and burned between Vacaville and Fairfield. 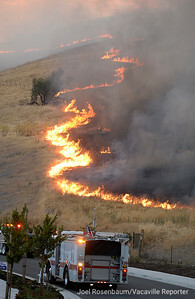 Firefighters from the Fairfield Fire Department make an attack on the hillside above eastbound Interstate 80 near Nelson Road. 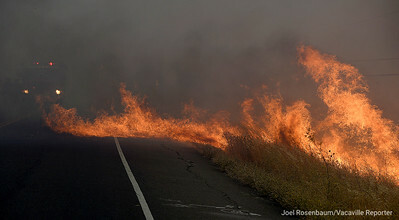 The 1,000 acre grass fire that started along the freeway and burned between Vacaville and Fairfield. 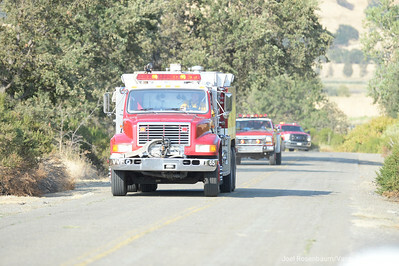 Crews from the Vacaville Fire Protection District roll along Nelson Road in Vacaville Friday as they prepare to make an attack on a portion of a 1,000 acre grass fire that burned the hills between Vacaville and Fairfield. 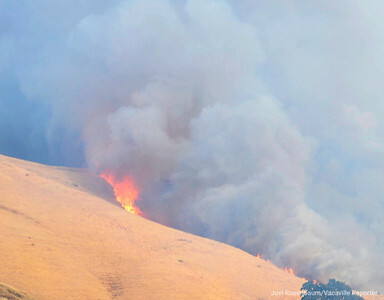 Fire burns out of control along the hillside above Lagoon Valley Road Friday in Vacaville as the Nelson Fire burns toward the hills above the park. A fire crew from the Vacaville Fire Department provides structure protection at the SPCA animal shelter on Peabody Road in Vacaville. The animals at the shelter were evacuated from the complex. 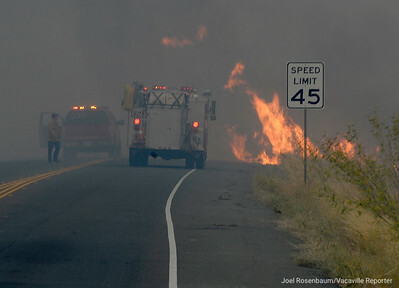 Flames flare up along Peabody Road between Vacaville and Fairfield as a fire crew from Napa County prepares to make an attack as the fire burns toward the Foxboro neighborhood of Vacaville. 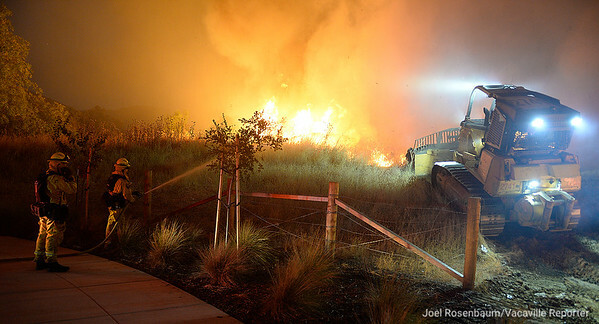 Flames burn on both sides of Peabody Road between Vacaville and Fairfield early Friday night as a fire crew from Napa County prepares to make an attack as the fire burns toward the Foxboro neighborhood of Vacaville. 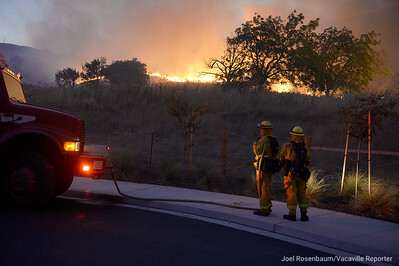 A fire crew from Napa County prepares to make an attack of a portion of the Nelson Fire Friday as the fire burns toward the Foxboro neighborhood of Vacaville. 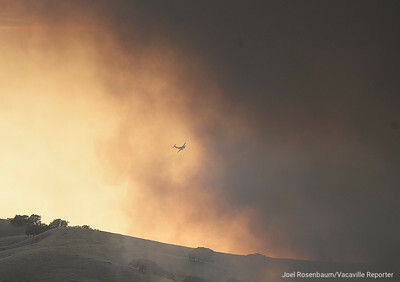 A spotter plane from the California Department of Forestry and Fire Protection flies over the hills above the California Medical Facility Friday as smoke billows into the air from the 1,000 acre Nelson Fire. 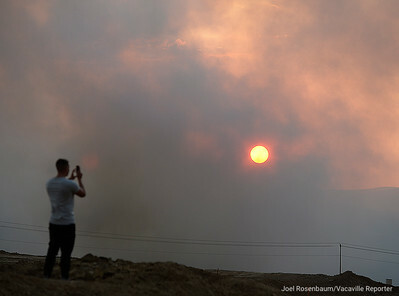 People stopped along Vanden Road between Vacaville and Fairfield watch as smoke from the 1,000 acre Nelson Fire billow into the skies above early Friday evening. 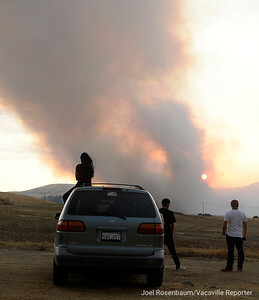 Smoke from the 1,000 acre Nelson Fire billows into the skies above Farifield early Friday evening. Flames above homes in the Gold Ridge subdivision in Fairfield. 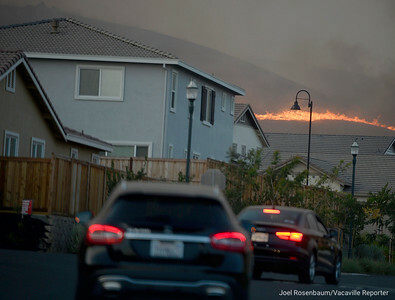 The Nelson Fire that started along eastbound Interstate 80 near Lagoon Valley had consumed 1,000 acres between Vacaville and Fairfield and was 10 percent as of 11 P.M.
Crews from the Fairfield Fire Department sit on Discovery Way in the Gold Ridge subdivision providing structure protection as they battle the 1,000 acre Nelson Fire early Friday evening. 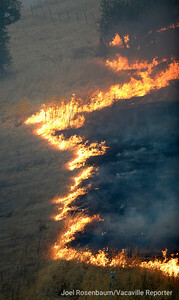 Flames burn in the hillside above Discovery Way Friday in Fairfield during the 1,000 acre Nelson Fire. 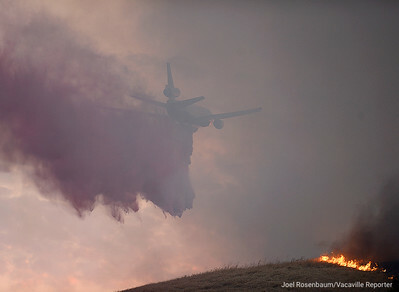 A contract air tanker prepares to make a fire retardant drop on hillside above Discovery Way Friday in Fairfield. The VLAT (very large air tanker) was one of 6 fixed wing aircraft that were dispatched to the a large grass fire that burned about 1,000 acres between the cities of Vacaville and Fairfield. 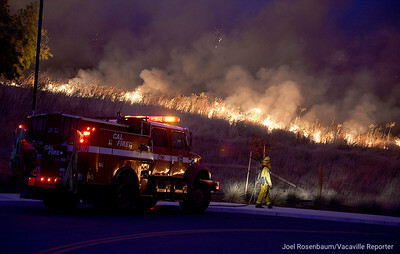 Fairfield Fire Department firefighters make an attack on a flare of of dry grass along Hancock Drive Friday in Fairfield. 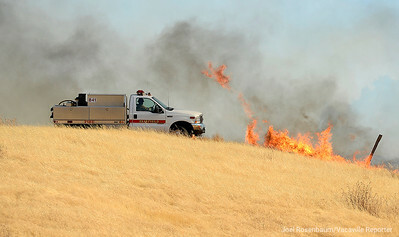 The crew was one of several in the Gold Ridge subdivision off Peabody Road while performing structure protection, as they battled a 1,000 acre grass fire that burned between Vacaville and Fairfield and started along eastbound Interstate 80 near Lagoon Valley Road. 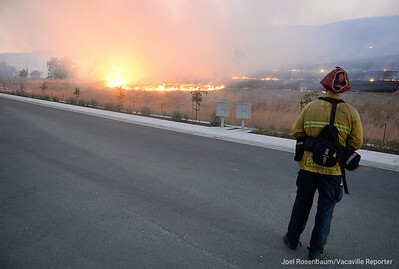 Vacaville Fire Department Captain, Ryan Purnell monitor the progress of the Nelson Fire as it burns toward Discovery Way in Fairfield Friday as they provide structure protection for the homes in the Gold Ridge subdivision along Peabody Road. 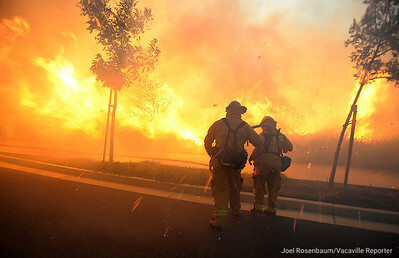 Firefighters from the California Department of Forestry and Fire Protection monitor the progress of the Nelson Fire as it burns toward Discovery Way in Fairfield Friday as they provide structure protection for the homes in the Gold Ridge subdivision along Peabody Road. 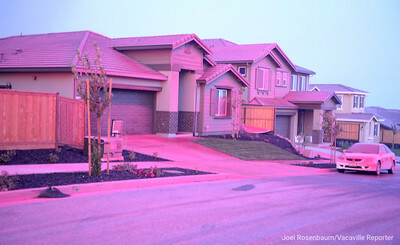 A home and vehicle along Discovery Way in the Gold Ridge subdivision in Fairfield are covered in fire retardant after an air tanker made a drop in the hills above the neighborhood. 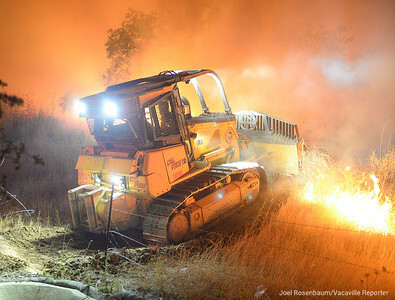 A bulldozer from the California Department of Forestry and Fire Protection cuts a fire break in the hills above Discovery Way in the Gold Ridge subdivision Friday evening. 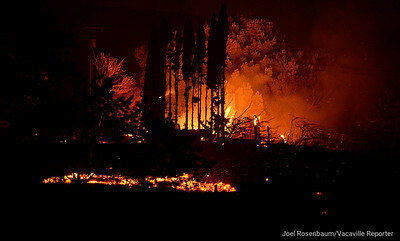 Flames burn in a home in hills above Peabody Road Friday night as the 1,000 acre Nelson Fire burns . The home was the only one that was destroyed in the blaze.